J. Cole’s Born Sinner has outsold Kanye West’s Yeezus by several thousand units, and he doesn’t seem to care. “I don’t wake up every day like, ‘I got a great status in the rap game.’ No, I feel behind. I don’t feel like I’ve done enough,” he explains over the phone. It’s press day for Cole’s involvement with Ubisoft title, Splinter Cell: Blacklist, and clearly he has a lot more on his mind than video games. These days, J. Cole’s career is a lot different from how it was in college. 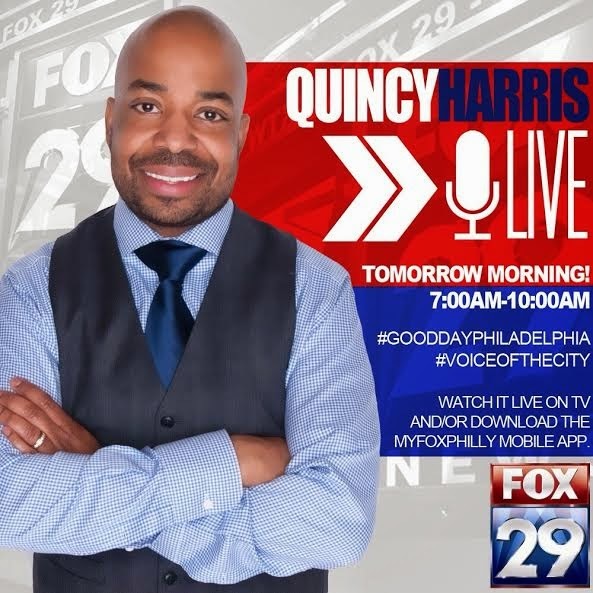 His “Power Trip” single is certified platinum, his new album is certified gold, he just kicked off his What Dreams May Come tour to a sold-out crowd of 4,000 on opening night, and his Dreamville Foundation is sending kids from his community back to school with new backpacks and supplies. Of course he doesn’t have time to play video games. Some of the loudest chatter of the year comes in light of Kendrick Lamar’s name-calling tirade of a verse on Big Sean’s “Control.” J. Cole’s inclusion on the list of MCs whom Kendrick Lamar is “trying to murder” in particular raises an eyebrow because, for the longest, the two were in cahoots to release a collaborative project. Earlier this year, Cole called his still unreleased work with Kendrick “mad competitive,” and maintains a similar outlook on recent developments. Other than that, he has little to say about the subject. “That’s rap, man. That’s rap music. That’s a part of the game. It’s natural. It’s fine,” he says as the call is ending. He’s sounds a little annoyed, but far from worried. One gets the sense that J. Cole has his journey mapped out, and perhaps getting called out by Kendrick puts some pressure on him to execute, but it doesn’t interfere with his vision for how he’ll go about it. When asked if he thinks that he’s the best rapper out, Cole confirms that he does: “That’s the feeling. That’s how I feel, period.” The next step is getting everyone else to agree. Apple SVP of Design, Jonathan Ive, and SVP of Hardware Engineering, Dan Riccio, will take it from here. 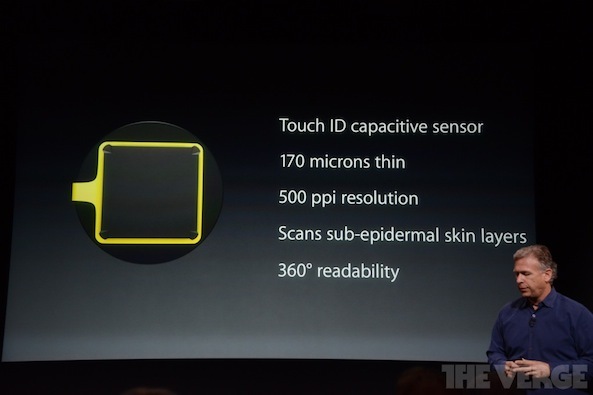 What do you think about Touch ID? Is it a killer iPhone 5s feature or just a fad? It looks like Ming-Chi Kuo was right. The KGI Securities analyst predicted, as did a few others, that Apple would be discontinuing the iPhone 5 alongside the launch of the iPhone 5s and 5c today. And they did. 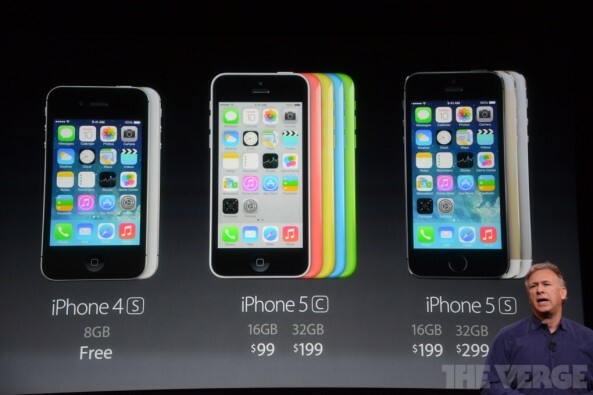 The 4S will be priced similar to the way the current iPhone 4 is now: free on contract. It’s odd that Apple chose to keep a 30-pin, 3.5-inch display device around, but perhaps the margins weren’t high enough on the 5 to get rid of it. 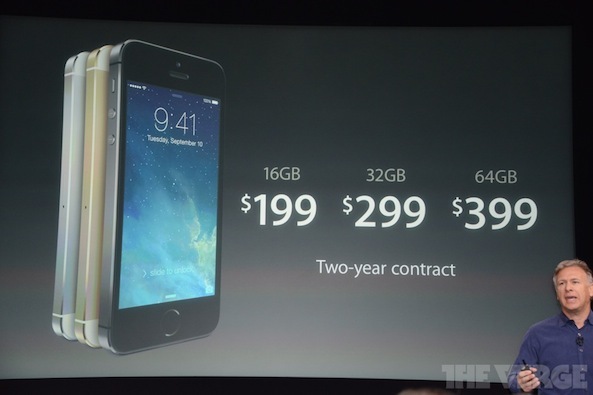 Note that the 4S model is of the 8GB variety, which is kind of low, but the device is still a steal at $0. 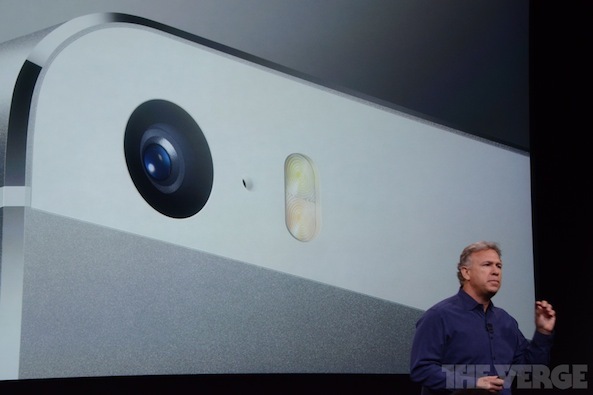 It has an 8MP camera, a formidable A5 processor, and will come with solid software features thanks to iOS 7—including an improved Siri. 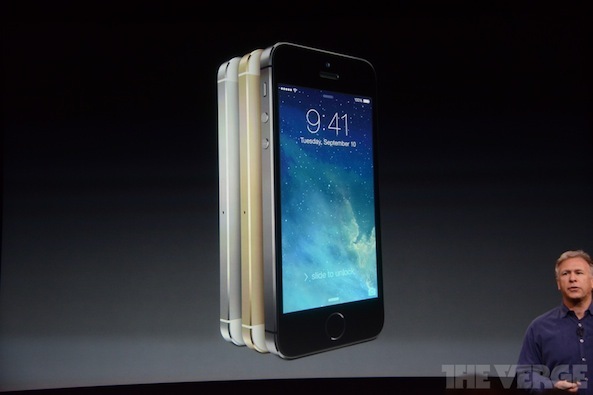 What do you think of Apple’s move to drop the iPhone 5 and keep the 4S around? Smart/not-so-smart? 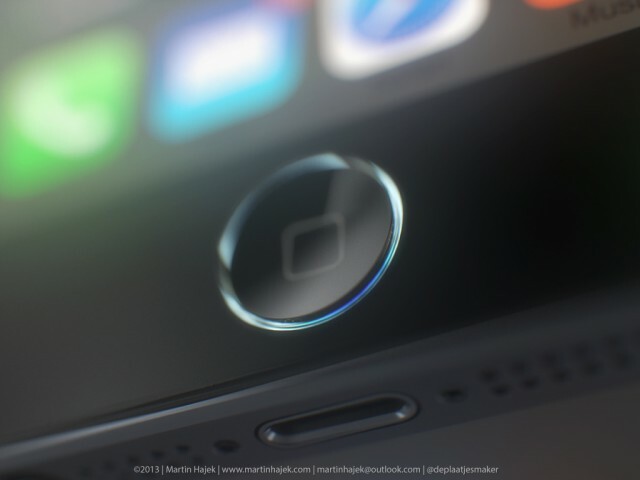 A last-minute leak from our friends over at the French blog Nowhereelse.fr suggested that Apple would refer to the rumored iPhone 5S fingerprint sensor as Touch ID. The rumors were true: Apple firs revealed the top-end iPhone 5S which has a much-improved camera and runs two times faster A7 chip that’s 64-bit (the first for a phone) and a new motion chip called M7. The executives saved the best part for the end of the presentation. 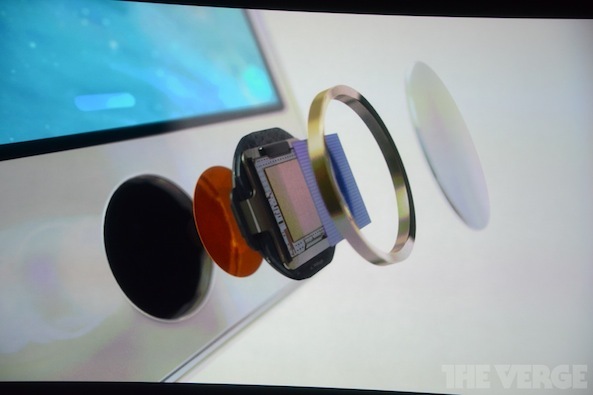 the built-in fingerprint scanning feature which draws from Apple’s 2012 acquisition of the Israeli biometric sensor experts AuthenTec. Jump past the fold for the full reveal.. In another potential breakthrough – and in accordance with leaks, patents and rumors – the fingerprint sensor is integrated right into the Home button’s silver ring. Confirming rumor-mill chatter, the sensor allows users to log in more quickly and with greater security. The sensor itself is 170 microns thin and is based on capacitive touch technology with a whopping 500 points per inch resolution which allows it to scan sub-epidermal skin layers in a 360-degree freedom. 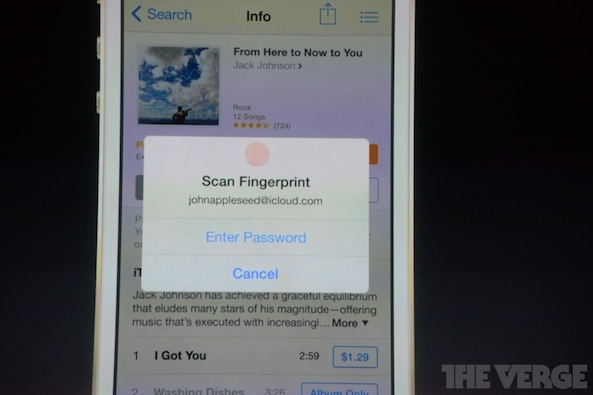 In other words, no matter how you swipe with your finger over the Home button, Touch ID just works. Another great feature: instead of entering your iTunes credentials each time you want to buy a new app or other content from the iTunes Store, iOS 7 simply puts up a prompt asking to scan your fingerprint. That’ll be a huge time-saver! Touch ID works in tandem with the underlying iOS 7 technologies and features like Activation Lock to prevent unauthorized access for thieves. 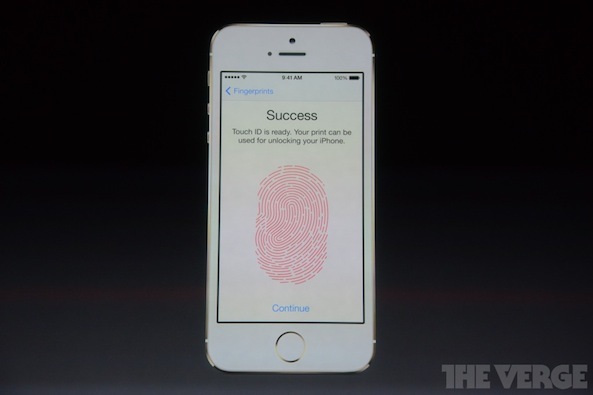 Apple assures that it stores your fingerprint on the device and says it never backs it up to the cloud. This is another seismic shift in mobile. Biometric security is important and with nearly half a billion iTunes accounts with credit cards enabled for one-click purchasing, the sky is the limit. While Apple did not talk about using fingerprint sensor to authenticate real-life purchases, we have no doubt in our minds that they will be rolling additional features over time. Right now, only the iPhone 5S has Touch ID, but with new iPads reportedly up for an introduction next month we think it’s only a matter of time before every iOS devices included biometric security as standard feature. 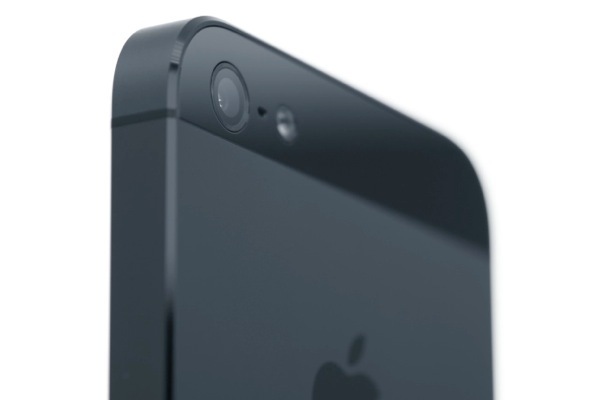 The plastic iPhone 5C won’t ship with the sensor because it doesn’t have a fast A7 chip. 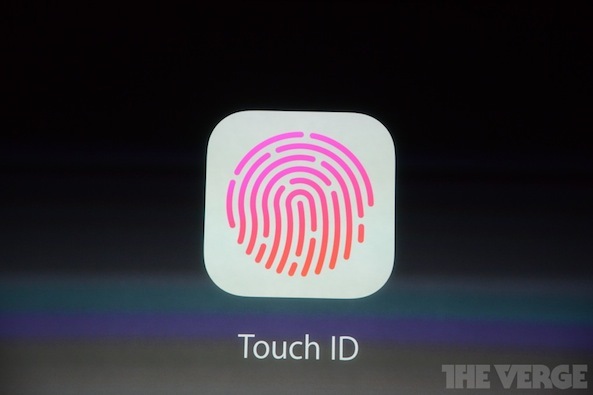 So, is Touch ID a killer feature? 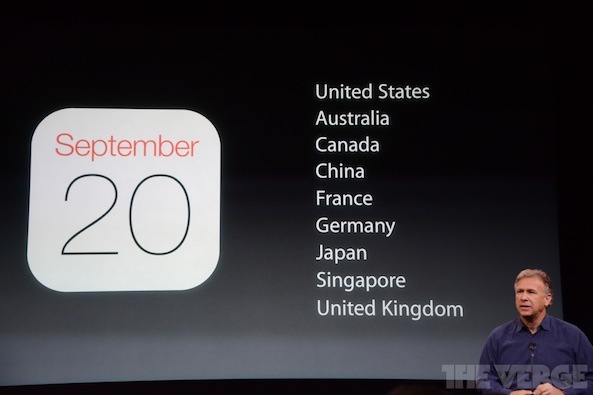 Pre-orders for initial launch countries (listed below) will start on September 13, and then it will be available in-stores on September 20. Note that this first group now includes China, which is pretty significant considering that it doesn’t typically get new Apple products until several months after launch. Well the big moment has finally arrived. After months of rumors, reports and speculation, Apple has just taken the wraps off of its new flagship smartphone: the iPhone 5S. For the most part, it looks like all of the rumors have been spot on. 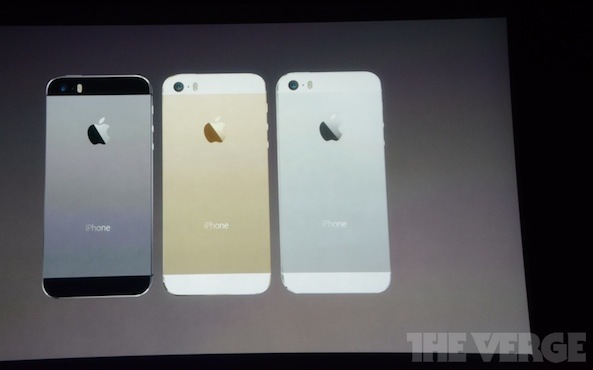 There’s 2 new colors: gold and ‘Space Grey,’ and there’s a pill-shaped LED flash on the backside of the handset. On the inside, the phone is running a brand new system-on-a-chip called the A7—it’s the first 64-bit processor used in a smartphone. And it’s really fast—over twice as fast as A6. It also appears that there’s a new component called the M7. It’s a “motion co-processor,” and it works alongside the A7 measuring things like the accelerometer, compass, and gyroscope. Battery life doesn’t appear to be much of an improvement over previous models. Apple is quoting 10 hours of 3G talk time, 10 Hours of LTE browsing. According to a new report from The Wall Street Journal, the rumors are true, Apple is going to introduce a new iPhone tomorrow morning with a fingerprint sensor built into the Home button. Analysts and industry insiders have long been calling for this year’s iPhone model, believed to be the iPhone 5S, to house a fingerprint sensor. But up to this point, we’ve seen remarkably little evidence of it. The Journal’s confirmation, however, adds a fair amount of weight to theory. So we wouldn’t bet against the idea. Apple purchased fingerprint-reader specialist AuthenTec in 2012, and owns all kinds of patents on related tech. Embedding fingerprint sensors into mobile devices isn’t new, but it has thus far proven unsuccessful. Yadron believes that both reliability and ease-of-use will help Apple succeed where others failed. We’ll find out for sure in less than 12 hours. Apple’s iPhone media event is slated to begin tomorrow morning at 10am PST. We’ll, of course, be covering the keynote live. So be sure to join us! 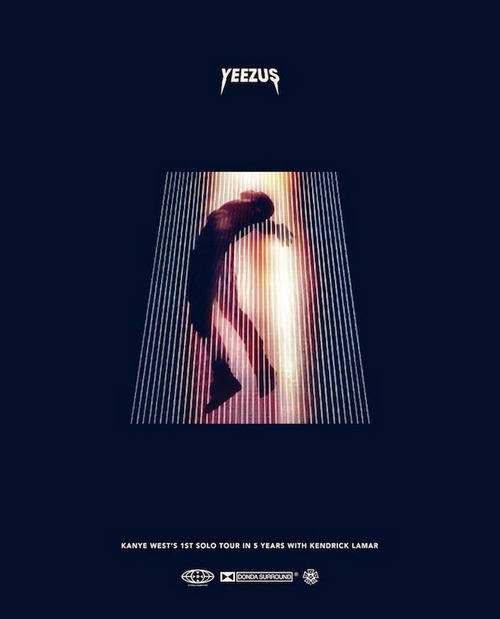 Kanye West will tour Yeezus, he announced this morning. The 23-city North American trek will be his first solo outing in five years; Kendrick Lamar will be the sole opener. Tickets go on sale next Friday. (They’ll probably be tough to get.) 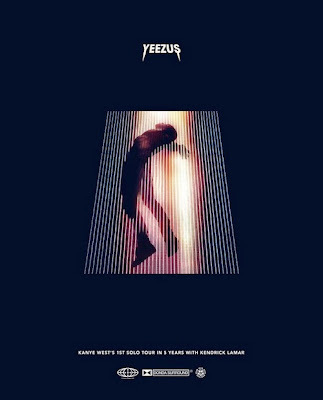 For now, see a full list of dates below and at Kanye’s site.